" The 1943 invasion of Bougainville, largest and northernmost of the Solomon Islands, and the naval battles during the campaign for the island, contributed heavily to the defeat of the Japanese in the Pacific War. Here Harry Gailey presents the definitive account of the long and bitter fighting that took place on that now all-but-forgotten island. A maze of swamps, rivers, and rugged hills overgrown with jungle, Bougainville afforded the Allies a strategic site for airbases from which to attack the Japanese bastion of Rabaul. By February of 1944 the Japanese air strength at Rabaul had indeed been wiped out and their other forces there had been isolated and rendered ineffective. The early stages of the campaign were unique in the degree of cooperation among Allied forces. The overall commander, American Admiral Halsey, marshaled land, air, and naval contingents representing the United States, Australia, and New Zealand. 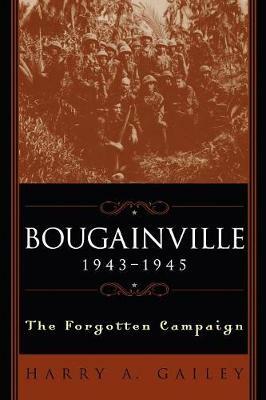 Unlike the other island campaigns in the Pacific, the fighting on Bougainville was a protracted struggle lasting nearly two years. Although the initial plan was simply to seize enough area for three airbases and leave the rest in Japanese hands, the Australian commanders, who took over in November 1944, decided to occupy the entire island. The consequence was a series of hard-fought battles that were still going on when Japan's surrender finally brought them to an end. For the Americans, a notable aspect of the campaign was the first use of black troops. Although most of these troops did well, the poor performance of one black company was greatly exaggerated in reports and in the media, which led to black soldiers in the Pacific theater begin relegated to non-combat roles for the remainder of the war. Gailey brings again to life this long struggle for an island in the far Pacific and the story of the tens of thousands of men who fought and died there.